We’re now in upfronts season, when the networks put their best faces and ideas forward (before the bloodletting that usually follows ratings assessments in the post-season, but we digress). Freeform touted its Marvel adaptations, premiering a trailer for the Cloak And Dagger series that showed how suited to the network the superhero teen show is. Attendees also got the scoop on the upcoming New Warriors series that will finally give Squirrel Girl fans what they want—that is, to see Doreen Green come to life. 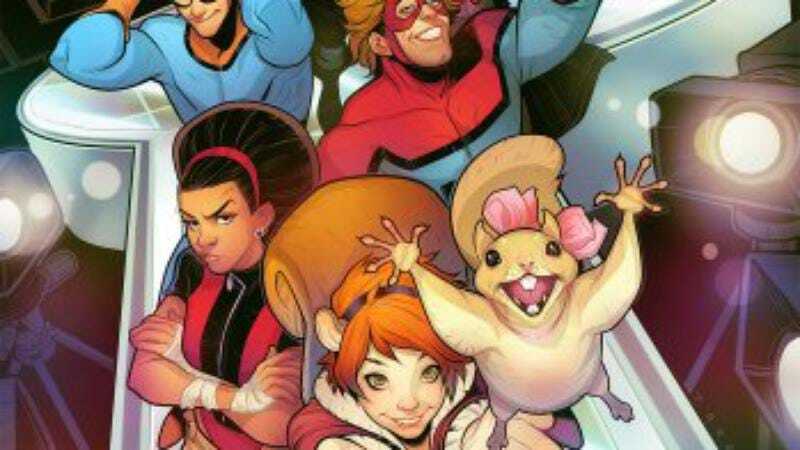 Freeform execs rattled off the core cast of characters and their abilities, beginning with Squirrel Girl and her powers, which include those of a squirrel and a girl. She’s described as “a natural leader—confident and tough, but not innocent.” Doreen is also “bouncy and energetic, and her greatest quality is her optimism.” On the other end of the spectrum is Craig Hollis, a.k.a Mister Immortal, a hero who claims he cannot die. He’s ”the team troublemaker and lothario,” but apparently, he’s not yet a skilled fighter. But his teammates shouldn’t worry, because he claims to have all the time in the world to learn. Joining them is Dwayne Taylor a.k.a Night Thrasher, who’s more of a social media hero than he is a crimefighter. He doesn’t have any powers beyond being really rich. But he is “brilliant, strong, and noble,” though, and believes deeply in justice, so he’ll probably still be a welcome addition. Robbie Baldwin picks up the slack in the superpowers department; the hero who comes to be known as Speedball fires off kinetic energy against his foes. This “impulsive and immature people-pleaser with a misplaced sense of confidence” is also the most anxious to prove himself, which could be trouble. Finally, there’s Zack Smith a.k.a Microbe, a “shy hypochondriac” who is able to communicate with germs, from which he learns all about his friends and potential enemies. “It’s impossible to keep secrets around him,” warns Freeform. Microbe’s ultimately a “big sweet guy the team takes under their wing,” but Deborah Fields could give Mister Immortal a run for his money in the trickster department. As Debrii, she’s a low-level kinetic and out lesbian who “calls people on their BS and has no fear of putting her opinions out there.” But Debrii has also suffered great loss following some “heroics,” so she’s probably already aware of the “great power/great responsibility” mandate. Casting on New Warriors will reportedly begin soon.